Bickford Park. Photo by kaeko, from the Torontoist Flickr Pool. In a community centre gym by Christie Pits on June 20, three large posters showed three proposed layouts, windows into a possible future for Bickford Park, located at Harbord and Grace streets. With yellow feedback sheets in hand, residents had their say at the open house, placing red dots on preferred features. There were lots of red dots on Poster A’s shurb-lined off-leash area. “I’m a dog owner and lover, so I think a natural barrier like this is a really great idea,” said resident Meaghan Dorian, who lives on Grace Street. “I think fences are eyesores, and the park is my opportunity to enjoy nature, and how I do that is with my dog.” Others—particularly those who use the park for sports—weren’t as enthusiastic about the idea. Bickford is already a popular destination for dog owners, but the rules for off-leash canines are fuzzy, and, resident Arjun Chatterjee thinks, unenforced. The century-old park is constantly busy, and conflicts between dog owners and permit users are commonplace. 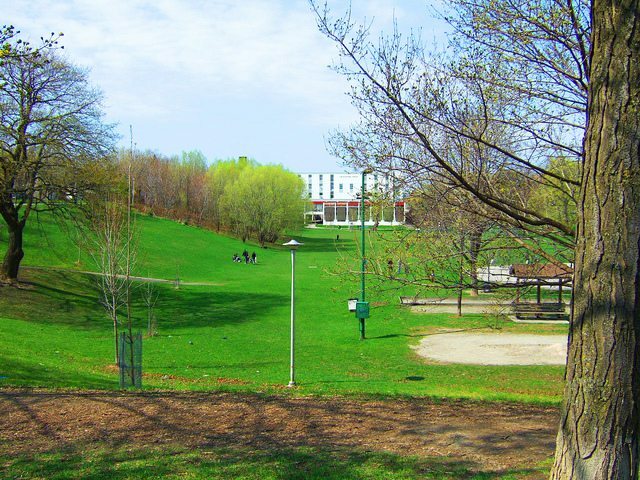 By convention, dog owners have congregated at the north end of the park, right beside the north diamond, where Toronto Playgrounds Baseball holds its tee-ball games. For Mike Zimmerman, who organizes the league for 160 kids, removing the north diamond is out of the question. Instead, he hopes the park remains in its current configuration. Bickford has been in need of an update for years, and the task, for local Councillor Mike Layton (Ward 19, Trinity-Spadina), isn’t easy. Layton wants to seek a compromise that everyone will be happy with. “It’s not an easy process,” he said. “There’s a very finite amount of space, and there are more and more demands on the space.” His office has collected survey data and held bimonthly meetings with a cross-section of park users. He won’t have much time to find a solution. With likely capital funds lined up for Bickford in the City’s 2014 budget, Layton’s office only has until July 15 to hear feedback. A finalized layout plan should come shortly thereafter. Existing conditions at Bickford Park. Poster images courtesy of the City.